Today's Guardian reports the attempted suicide bombings at UK airports under the headline 'A plot to commit murder on an unimaginable scale'. Any attempt to take human life is abhorrent, and thank heavens the alleged plot was foiled. But let us not forget that killing on an unimaginable scale by aircraft is not the monopoly of any one ideoology. On the night of 13th to 14th February 1945 RAF Bomber Command carried out two devastating raids on the city of Dresden. In all 768 aircraft dropped 2,646 tons of high explosives, incendiaries and flares. Shortly after midday on on 14th February a formation of 316 bombers returned for a third attack in which a further 782 tons were dropped. All three raids met with minimal resistance from German aircraft or anti-aircraft guns for the reasons explained above. The city was crammed with refugees fleeing from the advancing Soviet forces. The death toll from the raids will never be accurately known, but conservative estimates put it at about 25,000. The quotation in the second paragraph is taken from Among the Dead Cities. This is a brilliantly researched and written, and deeply disturbing new analysis by philosopher A.C. Grayling of the Allied policy of 'area bombing' that led to death and destruction in Hamburg, Dresden, Tokyo and many other cities. A brilliant study of one of the most complex issues of morality of modern times which concludes that the policy of area bombing was unecessary, disproportionate, and was in defiance of accepted moral standards. Another new addition to the Dresden literature is Firestorm, the Bombing of Dresden, 1945, edited by Paul Addison and Jeremy A. Crang (Pimlico, ISBN 184413928). This is an antholgy of contributions to the colloqium on Dresden organised by the Centre for Second World War Studies at the University of Edinburgh in 2003. Particularly noteworthy are Nicola Lambourne's chapter on the reconstruction of the city's monuments (see I am a camera - Dresden), and Alan Russell on why Dresden matters. The latter includes a survey of post-war musical activity (including Rudolph Mauersberger's scandalously neglected Dresden Requiem), and gives us a timely reminder that the first performance of Britten's War Requiem outside the UK took place in Dresden in 1965. 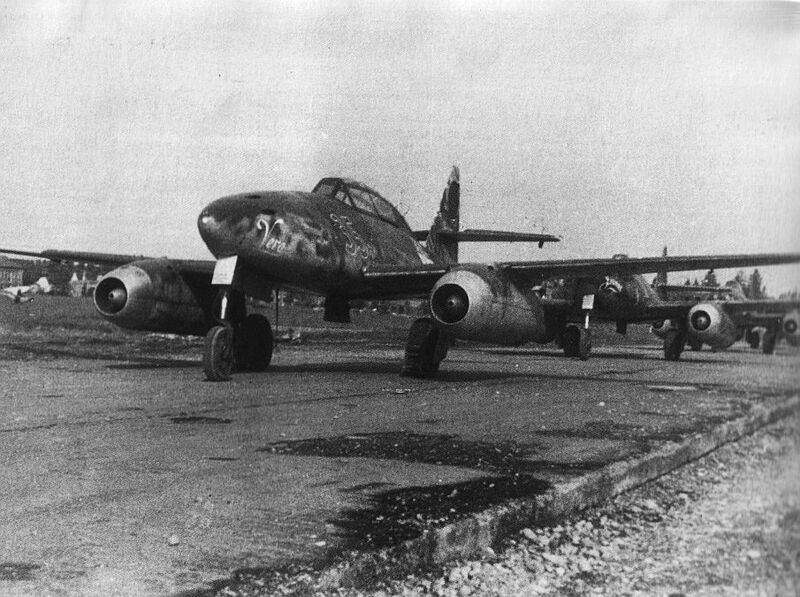 Image credit - Me 262 Aeronautics.ru Any copyrighted material on these pages is used in "fair use", for the purpose of study, review or critical analysis only, and will be removed at the request of copyright owner(s). Report broken links, missing images and other errors to - overgrownpath at hotmail dot co dot uk. And let us not forget the bombing of Hiroshima and Nagasaki, the 61st anniversary of which passed almost unnoticed last week. Is it true that "you did not intend that particular child to die"? Wasn't the actual intention to kill as many civilians as possible? The bombing was intentional and the civilian death was intentional. That's quite different from our days where Western countries do not intentionally target civilians. PS I completely disagree with Grayling's argument of course, but that isn't what I want to discuss. Berend, the apologists for the massacre in Dresden, and as you know I am not one of them, would claim they did not intentionally target civilians. Dresden was considered to be a strategic target because it was a railway hub used to move armaments to the eastern front. The raids were supposedly targeted at the railway marshalling yards to the west of the main railway station. The horrendous civilian casualties were caused by a number of factors. The subways under the railway station were packed with sheltering refugees. This was where the heaviest casualties occured, and walking through those death chambers which have been restored as subways when I took a train to Berlin last year was one of the most chilling experiences of my life. The raids also suffered from the known phenomena of 'bomb creep' where successive waves of bombs are dropped away from the marked target. And a failure in the marking of the targets at the start of the raid meant that the bombs were dropped on blazing buildings instead of on flares marking the railway target. But whatever the apologists say the bomb tonnage dropped, the lack of defences, the huge refugee population, and the city's cultural importance make the bombing of Dresden a low-point of Western civilisation. I am glad you, pliable, reminded us of the supposed strategic targeting and justification for Dresden. While working on the Continent a few years ago I became aware of the frisson that my name sometimes prompted - Harris and 'war criminal' came to mind, apparently. I am not sure why you were so conservative about numbers. I tend to go with Vonnegut's 100K plus. Phil, thanks for your comment and visiting the blog. I noticed you coming in via a Google search for Epsom Glyn Grammar earlier. We must have been at that school at the same time, although I was several years below David Hemmings. Strange how these overgrown paths converge, and Britten seems to be a constant presence on them at present. How widespread are these apologies and when did they come into existence? Weren't they invented much later? I remember reading somewhere that the US initially was quite aghast at the British bombing the civilians, but started doing it themselves after a while. So it seems to me that initially this strategy had some acceptance, but perhaps the embarrassment wasn't invented until much later? Berend, you are correct, the US did not adopt 'area bombing' until late in the war, and for some time were opposed to the strategy. But the third wave of bombers that attacked Dresden were in fact US. The 1st Division of the US 8th Army Airforce sent 678 tons of bombs and incendiaries to Dresden, although not all were dropped on the city, some were dropped on nearby Chemitz. The US also used area bombing with dreadful results on the city centre of Tokyo, and Grayling cites this in his book. Further to US attitudes. My understanding is that Eisenhower as commander of all forces on the ground in Europe wanted (needed) British Bomber Command resources 1944 onwards to attack active German military nearer the frontline and thought the so called 'strategic' bombing of German cities a serious misuse. His requests were turned down. 'Bomber' Harris was unreachable and presumably had some protection from Churchill. Correct me if I am wrong. I do not have authoritative sources to hand. Returning to the current middle-east; attacks by air and long-range artillery. I heard Israel knocked out another power station this morning. That has potential for a lot of long distance casualties in the next weeks. Plesch in the Guardian yesterday recalled pragmatic value of the moral high ground. Yesterday I sent an email of support (not on pragmatic grounds - more a matter of keeping my own head/heart straight) to the Archbishop of York for his week long vigil and fast on behalf of peoples of middle-east. No mean feat if he has to pop out from the office every hour to light a candle and say a prayer, and sleeps in the old Minster. I belong to no religion but if I was near York I would pop in and lend a bit of moral support. The bishops email is office@bishopthorpepalace.co.uk . Nice place also for a concert I am told - somebody could perhaps combine the two together at short notice? Any suggestions? Assuming that the plot had achieved its aims the number of dead would probably not have exceeded that in the Nato bombing of Yugoslavia in 1999. What's so "unimaginable" about that? And they are talking of putting the North Atlantic Terrorist Organisation between Israel and Lebanon. While the NATO (North Atlantic Treaty Organization) bombing of Yugoslavia in 1999 has done more than anything else to alienate large parts of Eastern Europe and the Former Soviet Union from "the West", it should also be recalled that the intention of the bombing [the so-called 'good intention'] was finally to stop the 'genocide' of Muslims by the Serbian State in the Balkan conflict and the dissolution of the Former Yugoslavia [it was the gravest incidence of genocide in Europe since 1945]. Bill Clinton acted after realizing that 'the West' and the U.N. had failed to stop the genocide occuring in Rwanda in 1994, which resulted in the deaths of over 800,000 Africans over a three month period. After watching the documentary " The Fog of War" with Robert McNamara, former Secretary of Defence during Truman and Kennedy, where he ponders that these decisions to kill "em masse" actually helped to shorten the war and save more soldiers' lives, I just ponder on the actual Power these people hold over the planet's lives. Amazing that there was no Nuremberg trial applied to these people, just because they were acting in the name of Freedom. The morality of war & killing is a long chain - where does it begin - where does it end?